You can find out more about all of the readers’ choices for captivating books here! What happens when we approach disagreement not as a problem to solve but as an opportunity to practice Christian virtue? 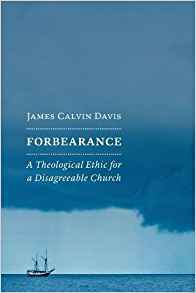 In this book James Calvin Davis reclaims the biblical concept of forbearance to develop a theological ethic for faithful disagreement. Pointing to Ephesians and Colossians, in which Paul challenged his readers to “bear with each other” in spite of differences, Davis draws out a theologically grounded practice in which Christians work hard to maintain unity while still taking seriously matters on which they disagree. The practice of forbearance, Davis argues, offers Christians a dignified, graceful, and constructive way to deal with conflict. Forbearance can also strengthen the church’s public witness, offering an antidote to the pervasive divisiveness present in contemporary culture. I’m honored to have my book included in their Advent Calendar, featuring “the best books of 2017”! Forbearance is the December 18 entry.